Harry (Anthony Edwards), is a love-struck trombone player who has finally managed to get a date with Julie (Mare Winningham), a server at Johnie’s in L.A. An electrical fire shuts down power to Harry’s building and he oversleeps for their date. Rushing to the restaurant three hours late, he answers a pay phone. The voice on the other side is terrified and nearly in tears. The voice tells Harry that nuclear missiles are going wipe out everything in just over an hour. 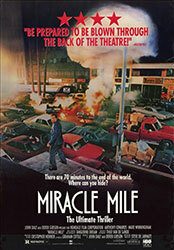 Miracle Mile begins in a calm fashion. It allows the characters and the viewer to idle in the romantic comedy of the first act. Harry has a nerdy self-assured nature that is disarming. Julie is no maiden-in-waiting; she is her own person with her own boundaries. The story skillfully shows us how these characters interact with their world in just a few scenes. Miracle Mile even throws in a cast of quirky characters at Johnie's, the 24-hour restaurant where the plot begins to kick-off. Like the faux romantic comedy opening, this is a ploy to get the viewer to drop their guard. We won’t be seeing much of these people after things get under way. The movie warns us that severe shifts in tone are coming when Harry absentmindedly throws a lit cigarette away. A bird picks it up, and at first we see the comic image of it with a lit cigarette in its beak. We cut away and when we return to the bird, it has lit its own nest on fire. 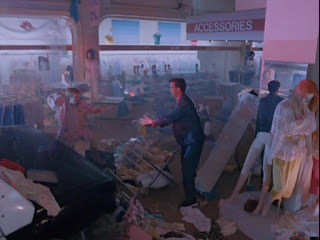 It’s a brilliant multi-functional scene that not only results in a key plot point of Harry oversleeping as the fire knocks out power to the building, but it also serves as a demonstration of the film’s fluid tone and a metaphor for the nuclear annihilation that is coming. Scenes repeatedly escalate with slyly comedic moments building towards unexpected tragedy, and it all tumbling into outright chaos by the end. Miracle Mile is pretty progressive for 1988, it has a diverse cast of various genders, and races. There are trans and gay characters, and even through their screen time is limited, they are presented as people instead of punchlines. Wilson (Mykelti Williamson), an African-American is first shown as a stereotypical thief, but he is later shown to have an inner emotional life and devotion to his sister that drives him to extremes. Brian Thompson makes an extended cameo as gay Vietnam Vet who is true to his word even to strangers while facing WWIII. It is not all perfect, but for the time-period, it is impressive. In case of nuclear attack, apply cookie dough directly to eyes. Tangerine Dream create a soundtrack that is urgent, but still gives the action an unreality that suits just how an immense event might feel to those dealing with it on the ground.Between the soundtrack and look of the film, it all comes together as a floating dream of 1980s consumerism and the ever present nightmare of nuclear war. At the center, this is a traditional love story, and it is Harry and Julie’s continual search for one another that forms the emotional core of the film. There is a repeated mirroring of their relationship as we see other pairs of characters searching, finding, and more often than not, losing one another. Harry and Julie’s connection carries through even the utter madness at the end of the world. 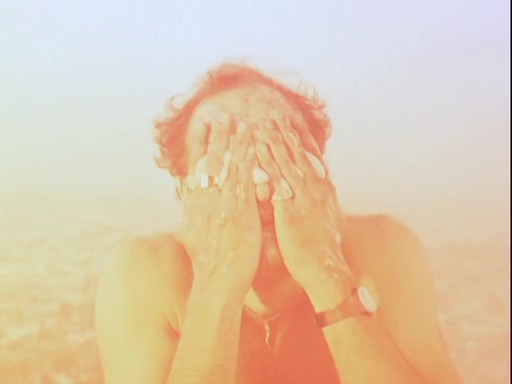 The movie pushes towards the question of whether their love could even transcend the apocalypse. A question sadly still relevant today.